Man-made religious decorations are a common sight at this time of year, but the image on a tree in an Arlington man's front yard is natural and some neighbors have begun calling it a holy tree, according to some Florida residents. Neighbors near Daryl Brown's Arlington home said a tree in his yard bears the image of Jesus. The likeness has created a buzz in the neighborhood and has many residents at a loss for words. "I see the face, eyes, and you can see the crown," said one neighbor. "I can't say what I feel, I just feel it," said another neighbor. The image was discovered a week before Christmas by a woman walking her dog, the report said. Overjoyed by what she saw, the woman shared the news with her neighbor. "Nancy said, 'Would you like to see something? Just make sure you see it. I don't want to have to show it to you first," Brown said. Brown recently moved to Arlington from Texas. He said the tree has given him and his family comfort as a symbol that everything is going to be OK in their new home. Man, that is one scary-looking Jesus! Seriously, it's like if Jesus were an Ent. 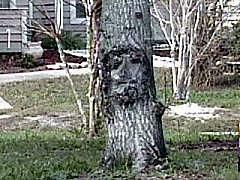 A scary ent. And the disciples came upon Jesus and asked, "What may we do to please you my Lord?" Jesus replied, "Hey would you mind spreading some manure near my feet? Thanks!" I was crying on a bed praying to God. To save me from an addiction on Jan, 2 of 07. I did not believe Jesus could save me, I thought I was a waste. The next day I packed my things and left for home. To Michigan. I had to wait for my last paycheck to leave. I was scared but I took my 600 dollars and walked past the drugs to my truck. I drove two days to Michigan, turned my self in to what I was running from. Still not knowing why.I have become a believer. I heard of the tree on the radio. I thought to stop, but I kept going. I did not know what gave me the strength to walk to run away from drug that had me. Two run back to a past I never thought I would face again. Let alone without a worry. I know now. Jesus. He drove that truck. Yes that tree is real. I don't know how many people prayed that night. The night He gave us this gift. But I do know He, Jesus gave this gift. My name is Scott Fox I am 25 years old. I used hate God. Now I lovingly serve HIM. Please feel free to write me about anything. I mean anything.